India is a fast evolving and developing country with ever-more resources and capital being poured into the Indian web market to digitalize the country. A particular tool that has allowed this digital development has been the introduction of cheap and reliable smartphones in the market which allowed a large portion of the country to afford the technology. Additionally, cheap internet plans contributed significantly to encouraging and increasing the overall internet usage. Consequently, diverse facilities and services emerged from phone apps, allowing users to buy, sell, order and enjoy different types of facilities and services from electronic shopping, to cab hailing, food delivery and more. Presently, India stands among the most internet-friendly ecosystems in the world and the scale and scope of this new emerging market are bringing a major revolution in the overall Indian market. For example, Government schemes are increasingly centered around the startup culture and youths are encouraged to become entrepreneurs and create their own businesses. GrabOn, the coupons and deals marketplace, conducted a study entitled ‘Indian Internet Market Statistics’ in a bid to showcase the increasing digital trends as India is fully embracing digitalization. Indeed, the study reveals that India is consuming internet data like nowhere else on Earth. The data shows that sectors like e-commerce, cab hailing, online food order and delivery and telecom among others are thriving under this digital revolution made simple with the introduction of smartphones. Pixr8 has collected the data, read, analyzed and transcribed them in an understanding format. The data depicts the growth and penetration of mobile and internet usage over the period of a year. 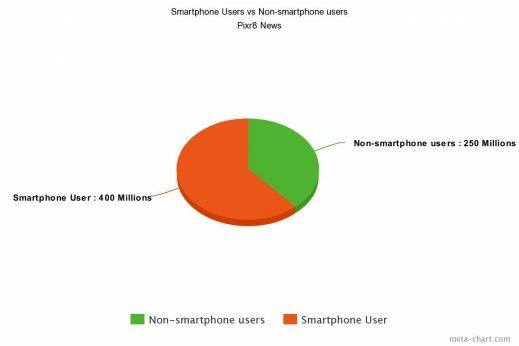 There are over 650 million phone users in India presently and over 400 million of them own smartphones, which is tremendous since cheap smartphones only reached the market in 2010 but reliable and cheap smartphones only reached the market in 2014. 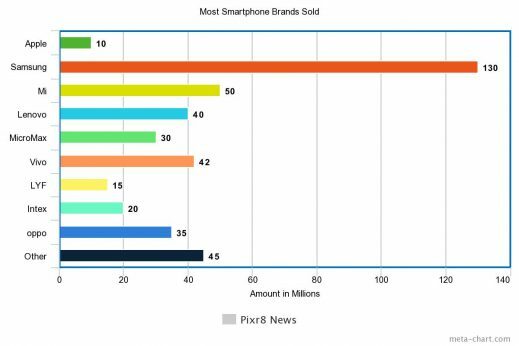 While Samsung provided smartphone models at expensive and cheap prices, Chinese brands such as Xiaomi, Vivo and Oppo electronics exploring the Indian market helped hugely in enabling lower and middle-class citizens to afford smartphones. If you look at 2017’s overall basis and previous five years before that, Samsung has been consistently leading the Indian handset market from 6 years in a row. For the last year, according to our GFK our value market share was 42 per cent which clearly places us as the market leader by a large margin in the country. 4) The e-commerce market is BOOMING! It is well-known that Amazon and Flipkart are battling toe-to-toe to maximize their reach and monopolize the Indian e-commerce market and this fierce battle has resulted in several e-commerce companies crumble against the means and capital of the two leading e-commerce platforms. 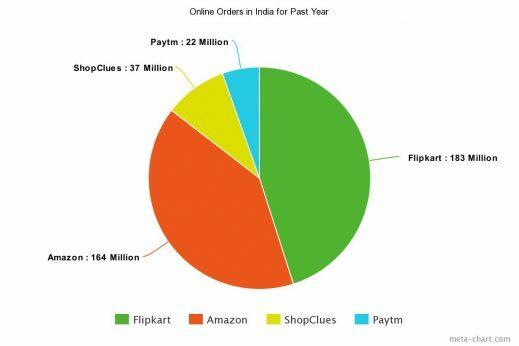 The study conducted reveals that Flipkart has a small edge over Amazon but both companies alone own over 85% of shares of the e-commerce market leaving their other competitors with little to content of. Making online payments is presently very easy and accessible and this is evident when we realize that over 11 billion online transactions were carried out over the past year. Paytm is unsurprisingly the leading online payment platform with over 2 billion transactions carried out under its umbrella. 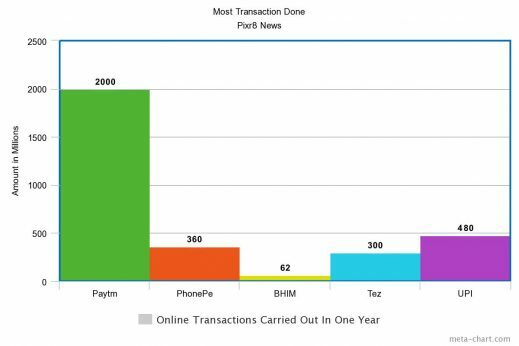 UPI comes second trailing Vijay Shekhar Sharma‘s platform by over 1.6 billion transactions. 6) The online food delivery market is becoming increasingly popular! It is known around the world that India is a foodie nation. Therefore it is logical that bringing food to few finger taps and swipes reach is assured of being a billion-dollar idea, or even more. In fact, the online food delivery market is today estimated to be worth $10.27 billion and the trend suggests that the market will keep expanding in the years to come. 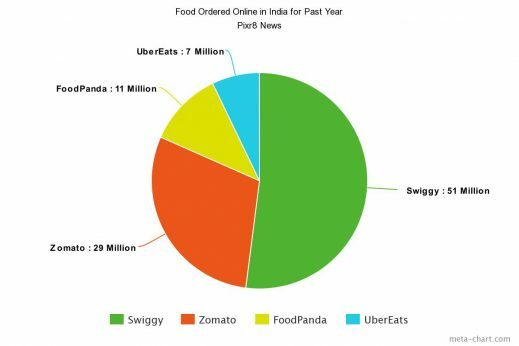 Swiggy and Zomato are currently the two leading platform in this market but other competitors such as FoodPanda or UberEATS have the means and capital to earn a major portion of the market with the right strategy. Social media is another major facet of the Internet and digital culture and major platforms such as YouTube, Facebook, Instagram, Twitter and Snapchat benefit hugely from the large Indian population and their extensive use of social websites, especially to share the average 24 billion selfies taken in a year. Facebook clocks over 155 million active users monthly in India and 6 million users access the platform via its mobile app. Instagram has 33 million monthly active users while Snapchat boasts a staggering 200 million monthly active users. YouTube, is the platform with most users in India with over 400 million accounts created on the video streaming website. Twitter is the least popular among the social media giants in India with a timid 2 million monthly active users but mind-blowing 200 billion tweets sent over a year. Whatsapp is the most popular messaging app in India and is used extensively for many purposes ranging from personal use to professional use. Indeed, the penetration of Whatsapp as means of communication is deeply rooted in the Indian society with over 200 monthly active users who sent 4,380 billion messages over the last year and 73 billion messages sent on New Year’s Eve only. Moreover, 329 billion photos, 73 billion videos, and around 110 billion Whatsapp status were uploaded by Indian users over the last year. 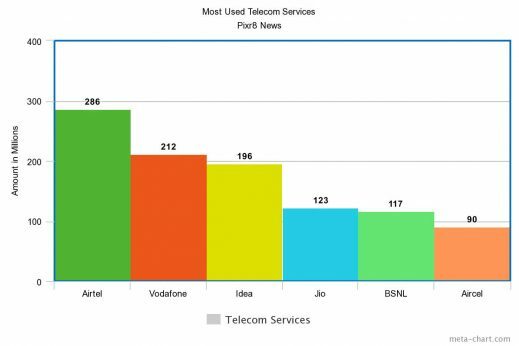 Whatsapp also made possible about 37 billion calls and 20 billion video calls for Indians to communicate effectively and for free. Hiring cabs for transport especially in Tier 1 and Tier 2 cities is a popular way of commuting and the numbers affirm this statement. Ola registered over 548 million rides over the last year while its American competitor, Uber, boasts over 260 million active riders. Flight is also a popular use of transport as over 117 million people traveled by air within India. However, the most popular means of transport in India, especially for long distances remains the Indian Railway, which recorded over 422 million berth and seats booked among which 10 million were on tatkal. It is fair to say that as per the numbers show, Indians are using smartphones and the internet in diverse aspects of their lives and owning a smartphone is really seen as an asset to facilitate one’s life. For example, smartphones and their apps are extensively being used for communication among peers, to do some shopping or buy groceries, for cashless payments and food delivery. The evolution of this digital revolution is also extending to other sectors such as health, insurance, loan credit and entertainment as well, cementing the digital culture further in the Indian society. Therefore, we can confidently say that this trend will go on an upward direction for years to come.